Best dog camera for your dog to help you keep an eye on your furry friend when you are not around, that’s what you want, right. As a dog owner I know how much we care for them. So, to help you choose the best I have done some time-consuming thorough research and found the best dog cameras for you below. You’re right a good dog camera will become a true extension or an electronic avatar of yourself. How? Let’s dive in. A good dog camera will allow you to watch your dog real-time from your phone, talk to your dog and let your dog talk to you, multiple users can use the app that is your whole family, dispense treats, record videos and pictures and the list goes on. But there are so many different types and brands of cameras for monitoring your pets. For sure, these cameras are smart and affordable. But which is best for you? To find out more about the very best dog camera please take some time and read the detailed review about their pros and cons plus comparisons. Pawbo Life Wifi Pet Camera is a great little camera with tons of features. 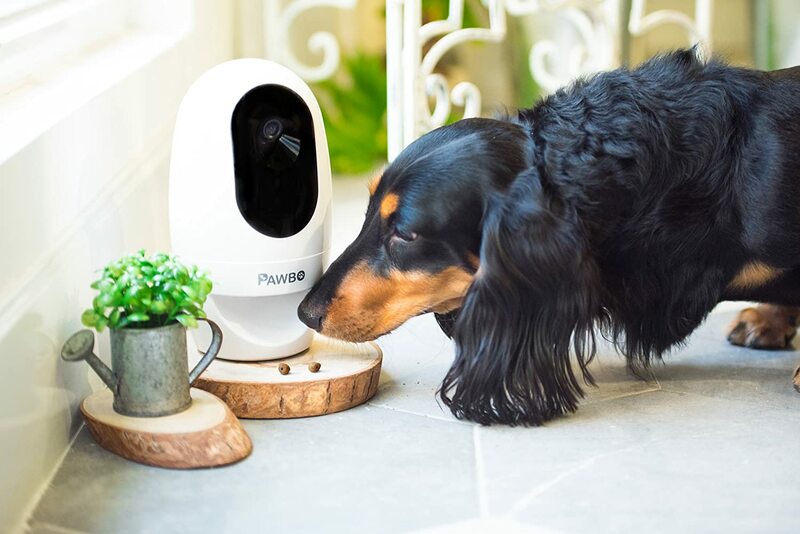 The Pawbo Life Wi-Fi Pet Camera streams video and lets you watch your dog in real-time, it supports audio so you can talk to your dog remotely. And you can treat your dog from wherever you are because it lets you dispense special treats. Yes you can also play laser tags. I think this is one of the best dog cameras available in the market today. Because of its handy and smart functionality at a very reasonable price tag. The highlights below will give you a quick indication about its main features. – Watch your dog live in High Definition Video from your phone. – You can zoom 4x for closer views. – 130° view meaning you will get a wider view. – Take pictures and record videos from your phone. – Supports 8 users, so your partner or your family can keep an eye. – You can talk to your pet and your pet can reply (two-way talking feature). – You can play a ringtone to grab attention of your pet. – It lets you dispense treats remotely. – Built-in light pointer can let you play with your pet or set it to auto from the phone app. – Great investment at an affordable price. – It is little pricey but that’s not a con. – Some customers have complaint about the durability of the product.